Upright structural supports don’t go to waste in this Twin Trash Receptacle Mail Slot Depository design. The double uprights provide for a copious stash of waste. However narrow mail-slot style entry limits the insertion of trash. A conundrum. 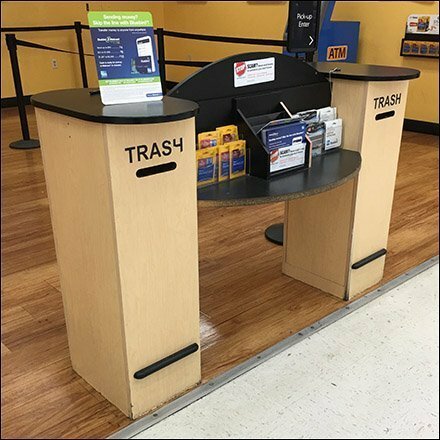 This Twin Trash Receptacle Mail Slot Depository was seen at Walmart near the Service Counter, where the twin table tops allow for check writing and form fill out. “ Recycling Retail Pinterest Board “ for a visual summary.